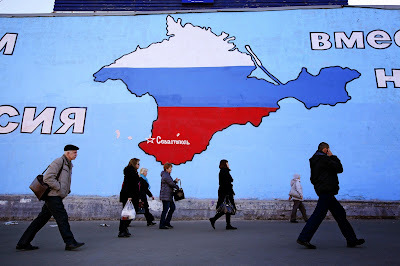 Pedestrians pass a mural showing a map of the Crimean peninsula filled with the flag of the Russian Federation, in support of the Russian annexation, in Moscow, Russia. Crimea’s “territory is strategically important” and for Russia it’s “like the Temple Mount in Jerusalem” is for Muslims and Jews, Putin said in his annual address to parliament in Moscow today. The Russian leader said he’s not surprised by the conflict in Ukraine, given what he termed “the coup and violent takeover of power” in Kiev in February. Ukraine is battling pro-Russian separatists in a conflict in its easternmost regions that’s killed more than 4,300 people and displaced 500,000 this year. The EU and U.S. have imposed sanctions on Russia, limiting access to capital markets for some Russian banks and companies, and blacklisting officials involved in the conflict. “Nobody has to be frightened by sanctions, which of course are harmful -- but are harmful to everybody,” Putin said. Russia is also being hit by falling oil prices that have dropped by more than 35 percent since June. Russia depends on oil and gas revenue for about half of its federal budget. The ruble has lost a third of its value since Putin started his incursion into Crimea. The ruble fell 1 percent to 53.7165 per dollar at 2:03 p.m. in Moscow today. Putin likened his global opponents to Adolf Hitler. Hitler, “with his humanity hating ideas was going to destroy Russia and throw us back behind the Urals,” Putin said. The Nazi leader committed suicide in his Berlin bunker as the city was captured by the Soviet Union’s Red Army in 1945. “Regrettably, Russia continues to supply new weapons and increase support for armed separatists,” Kerry said today at a meeting of foreign ministers of the Organization for Security and Cooperation in Europe states in Basel, Switzerland. Kerry will meet Russian Foreign Minister Sergei Lavrov today in Basel. One Ukrainian soldier was killed and 13 were wounded in 71 separate attacks since yesterday, National Security and Defense Council spokesman Colonel Andriy Lysenko told reporters in Kiev today. There are more than 32,000 mercenaries and Russian troops fighting in eastern Ukraine, Oleksandr Rozmaznin, General Staff representative and acting head of the personnel department of the Ukrainian Armed Forces, said today as cited by Interfax. The government in Kiev and separatists in the Donetsk and Luhansk regions signed a cease-fire agreement Sept. 5 in the Belarusian capital, Minsk, that’s been broken almost daily. Ukraine may hold talks next week with separatist leaders as NATO and the EU urged Russia to reverse course on the conflict raging across its border. A new round of negotiations may involve representatives of the rebels, Ukraine, Russia and the OSCE, former Ukrainian President Leonid Kuchma said in televised remarks. As clashes flared in the east, Ukraine’s new cabinet held its first meeting yesterday. Premier Arseniy Yatsenyuk said the country faces a “tough” budget in 2015 as the government seeks to resume talks over its ailing economy with the International Monetary Fund. The government must pass a 2015 budget to get $2.8 billion in IMF aid. It needs the money by the end of January to redeem debt, pay for heating fuel and shore up the hryvnia, which has lost 45 percent against the dollar this year.